Super Savings Item! 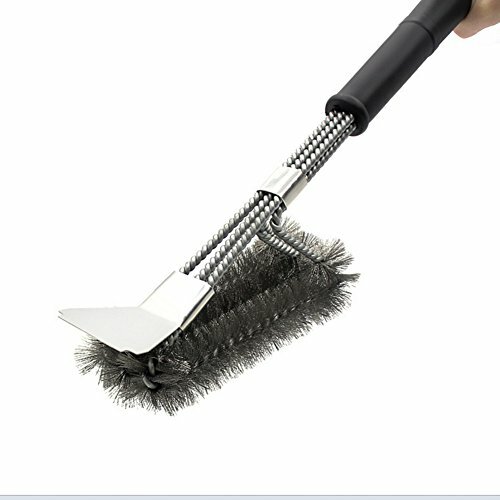 Save 38% on the Vee Safe Bbq Metal Stainless Grill Tools Parts Barbecue Cleaner Brush (Brush 05) by Vee at Rodale Institute Store. Hurry! Limited time offer. Offer valid only while supplies last. Triple high quality stainless steel bristles. Easily Removes Food, Grease, and Debris. Compatible with any bbq grill. Effective on all types of grills including Char Broil, Weber, Big Green Egg, Porcelain, Ceramic, Gas Grills, Charcoal, Smokers, Infrared and More! A perfect gift for the Grill Wizard. Long 9.5" Durable Handle, Provides a Safe Distance While Premium PP material ensures heat resistance. Stainless steel bristles and galvanized twisted wires. It boasts good rust prevention so that you can use it for long time. 3*6.5'' Large Enough brush head. Faster than with a Traditional Brush. It is very sturdy let we don't worry about the the stray bristles coming off into the food,it is more healthy! Enhancive Scraper: The extra strong scraper is effective to help remove the stubborn stains and root out the hard-to-remove lumps with ease. If you have any questions about this product by Vee, contact us by completing and submitting the form below. If you are looking for a specif part number, please include it with your message.